The PC-P430 Electric Paper Cutter's unique features make it a standout in the desktop paper cutter market. The cutter's compact design, automatic operation and ability to handle nearly an inch of paper in thickness by a full 17" wide make it the ideal solution for small business, schools, churches, copy/duplicating centers, EDP departments and desktop-publishing centers. Dual Push Buttons:The PC-P430 is activated only when the safety cover is closed and both cutting buttons are simultaneously pressed. The two buttons are sufficiently spaced to ensure operator safety. Safety Covers: The cutter is equipped with front and rear safety covers. The front cover includes a safety switch to prevent unsafe operation. Press Section: An automatic clamping press moves simultaneously with the cutting knife. A special cutout is provided to prevent book spines from crushing. Cut Stick Lift Lever: The cut stick is easily replaced by using the integrated lift lever. Safety Power Key: The power switch can be key activated to limit user access. Cutting Knife Counter: Cut cycles are indicated on a digital counter to help determine when the cutting knife should be replaced. Backgauge Handle: Backguage position can be adjusted simply and easily using this rotary handle. Backgauge Free Mechanism: Sheets longer than 320 mm (12.5") can be trimmed using the backgauge free mechanism. Push-out Lever: The operator simply pushes a lever to move cut sheets forward for easy removal, so it is not necessary to move the backgauge. Double Lead Screw System: Accurate backgauge raceway keeps the gauge square to ensure accurate cutting. Cuts through a stack of paper like nothing. Easy to adjust and is highly accurate. We put it on a cart so that we can wheel it around. It is way too heavy to move any other way. Love the smaller footprint and electric cutting. Table-top Paper Cutter PC-P43. Horizon, www.horizon.co.jp. 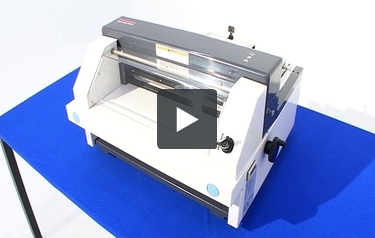 Do you want a desktop paper cutter that can process hundreds of sheet at once? If so, you need to check out the Standard PC-P43 Electric Desktop Paper Cutter. This is a high-quality device that quite possibly has everything you need. Here's some information about it - including its rating on a 1-to-10 scale - so you can determine if it's right for your particular needs. The PC-P43 can cut up to 250 sheets of paper at a time. This is a much higher cutting capacity than you'd find in either a guillotine or rotary trimmer, so it's a great device to have around if you need to cut a lot of paper at once. This cutter can work with paper that's up to 17 inches wide. Due to this, you'll be able to work with some of the most popular sizes of paper including legal-sized sheets (8.5" x 13"). Like many other trimmers, the PC-P43 is equipped with a backgauge. The backgauge has a handle so its position can be tweaked. This device is very safe to use thanks to a few key features. For one, this device has a keylock to prevent unauthorized use from occurring. Second, there's are safety covers over the cutting area to ensure your hands won't come into contact with the blade. The blade won't come come down unless the front safety cover is down. Finally, this trimmer is operated via two push-button controls. Both buttons need to be pressed to start operation after the safety cover has been lowered. If you're not quite sure where to cut, the PC-P43 will help you out because it has an illuminated cutting line. If the line isn't where you want it, you can adjust the position of the sheets to get the cut you need. Also, there's a spring-operated clamp that will hold your paper still so you don't end up with poorly cut sheets. This trimmer has cutting knife counter that will show how many times you've cut paper. This is helpful because it will give you some idea of when to change the blade. The PC-P43 is marketed as a desktop device thanks to its modest measurements. Its approximate dimensions are 27" (width) x 24" (height) x 15" (depth) so it will easily fit on just about any work surface. However, this is a fairly utilitarian-looking cutter, so it might not be a good choice if you want a machine that's more modern-looking. This cutter comes with a one-year warranty so you can be sure that Standard believes in its products. Final rating: 9. The Standard PC-P43 is a great cutter and would be a good choice for offices, schools, print shops, and more. This device has an excellent cutting capacity that will allow you to cut hundreds of sheets at once. The illuminated cutting guide is very helpful as is the cutting knife counter. This trimmer is really safe to use as well, which is always an important consideration when purchasing a cutter. Overall, this is a great trimmer, so be sure to take a look at the PC-P43. Do you have replacement blade and Optical cutting line light for the Standard PC-P430 Cutter? Thank you for your question. We are able to order parts for you directly from Standard. As parts are not returnable and we want to be sure to get the correct part for you, we will need the part # for the parts that you need. With that part # we can reach out to the manufacturer and get you a quote on cost and availability. Give our customer service department a call at 1-800-944-4573 and we can help you get the process started. Gracias por su pregunta. Aceptamos solamente el pago en dólares americanos, la tarifa de conversión dependerá de su banco o método de pago. Traducido con Google Translate.